During this year's challenge, my plan is to reflect on a slice of my life from that day, or the day before, and write about it. No theme to tie my writing together this year, no plans ahead of time. Just glimpses into slices of my days. Not having a plan is a very uncomfortable place for me, both as a person and a writer, so fingers crossed for the 28 days remaining! Karen, there isn't any ice coming out! I'm sure it's just stuck; open up the ice compartment, and see if the ice cubes got stuck and didn't fall down. No, there is NO ice at all up there! And the side is burning up! And all the food in the freezer is thawed. And the refrigerator isn't even cold. Crap! My husband was right. Our refrigerator died last night. So, at 11:15 on a Saturday night we began the process of researching online the type of refrigerator we'd like to get as a replacement. We are the first customers at Lowes. We came fully equipped with our online reviews, our tape measure, and our credit card. An hour later, after I tortured my husband by discussing at length the pros and cons of each refrigerator we liked, we settled on one, and purchased it. Then it was time to head home, and empty our entire refrigerator and freezer. Literally nothing was salvageable. And un-cold food leaves quite an odor behind. For now, cold drinks are being iced in a large cooler on our screened porch, we are buying multiple bags of ice to replenish the cooler, other cold foods are stored in the basement frig, and I am waiting (not so patiently) for our new refrigerator to be delivered Wednesday. I just love being a homeowner some days... not! Ugh! I hate dead refrigerators! So much lost food, and replacing them is never fun. Hopefully you'll be happy with the new fridge. Bummer -- at least you had Sunday to deal with it and it is lovely!! 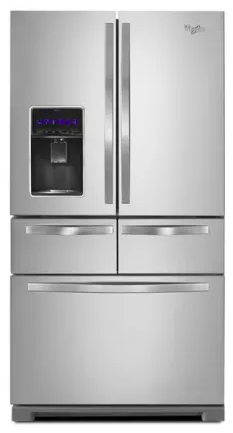 You made me laugh with, "An hour later, after I tortured my husband by discussing at length the pros and cons of each refrigerator we liked, we settled on one, and purchased it" and "Crap! My husband was right." Both made me laugh at loud -- love when powerful writing gets me laughing! Oh, friend... I have been in your shoes. While there are worse things that can happen to a house than a dead fridge (we once had 4.5 feet of water in our basement during a storm), a dead fridge is among the most frustrating. Good luck! Yikes, yikes, yikes! I hate this kind of stuff! It's never a good time to have a fridge die. At least you have a basement one and it's not ninety degrees outside. Can't believe you have to wait until Wednesday.